Business at the New Albany location of the world’s largest retailer was closed down Wednesday afternoon by an invader that weighed less than four pounds. Numerous public safety officers in at least six official vehicles responded to the threat at the Walmart store on the west side of Interstate 22. 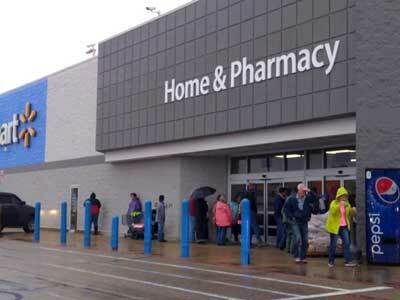 Walmart customers and employee, waiting in the rain as a hawk was being corralled. Hundreds of would-be customers were locked out of the giant retail store for about 90 minutes while officials dealt with the problem. While Walmart customers frequently see sparrows and other small birds inside the building, Wednesday’s incident is the first known instance of a red-tailed hawk invasion. Union County Emergency Management Director, Curt Clayton, was summoned to the scene and brought with him the specialized weapon needed to capture and subdue the intruder. The weapon was loaded with a projectile suitable for the occasion. The hawk was shot and anesthetized with a chemical dart. The big bird was then carried from the building, to be released when it woke up. New Albany Police Chief Chris Robertson estimated that the hawk had a wing span of at least three feet. 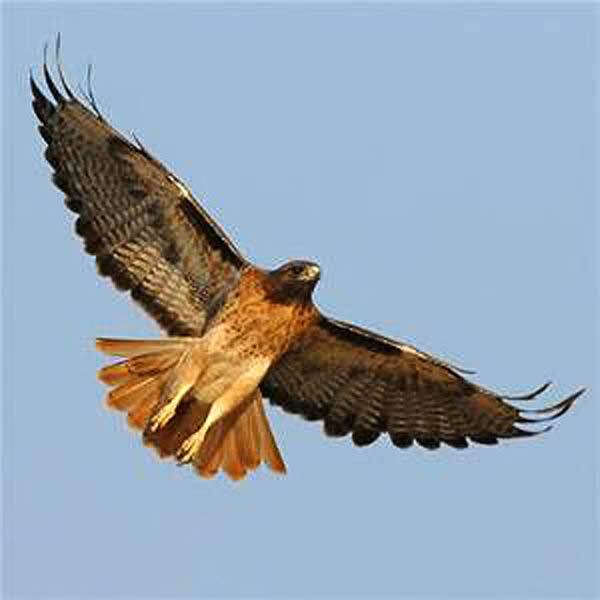 Since a mature red-tailed hawk (Buteo jamaicensis) typically has a wing span of 40 to 55 inches, Chief Robertson’s guess was well within normal limits. The incident started at about 2:00 p.m. and the hawk was captured and removed at about 3:30 p.m. Customers were allowed back into the building and the dollars started flying again to Bentonville, Arkansas, for the benefit of the Walton family et al.